Need a strawberry layer cake recipe? Then this recipe is just what you're looking for! Moist and delicious... you've just got to give it a try! A great way to combine strawberry and chocolate flavors! Begin by mixing the milk, oil, eggs and vanilla extract. Follow this by adding in the sugar, salt and baking powder. Lastly, add the flour, a little at a time, until all of it has been mixed in. That's all it takes to make the cake batter. To bake the cake, pre-heat the oven to 350 degrees Fahrenheit (180 degrees Celsius). Pour the cake batter into two 9-inch (23 cm) cake pans which have been pre-oiled or sprayed with baking spray. Bake the layers for about 30 minutes, or until a wooden toothpick inserted into the center of each layer comes out clean. Before frosting the cake, carefully level both layers of the cake by cutting the tops of the layers flat. Place the first layer on the cake storage dish upside-down so that you will be frosting the uncut surfaces of the cake layer. Frost the first layer, then very carefully set the second layer on top of the first, also upside-down. Frost the second layer, and the cake is finished! You can use whatever frosting you like, of course. For the layer cake in this page's photograph, the recipe was turned into a chocolate-strawberry cake recipe by using chocolate frosting. 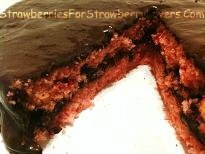 If you'd like to use a strawberry frosting, StrawberriesForStrawberryLovers.Com has a recipe which you can view by clicking here (clicking on the preceding link will open this page in a new window). Whatever the occasion may be for which you bake this cake, please enjoy it! And whenever you need a strawberry recipe, please check back with StrawberriesForStrawberryLovers.Com, Home of the World's Happiest Fruit!